I've been on a real cozy food kick now that the weather is getting cooler. Who isn't right? 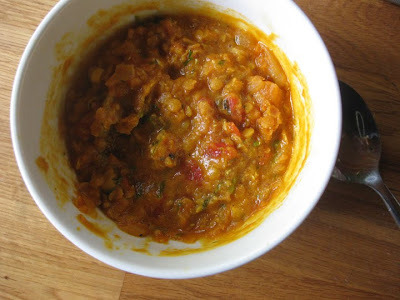 The other day one of my friends was talking about wanting to find more lentil recipes, and it reminded me of one of my favorites, tomato and lentil dhal with toasted almonds. It comes from a detox diet cookbook that I bought in the super-clearance section at Borders many years ago-- not because of any desire to do a detox, but because its recipes just looked really tasty and healthy. I have since done the detox once, and found it made me feel fantastic. I think the recipes in this book-- The Detox Diet Cookbook, by Nicola Graines-- made the diet much more bearable than others I've seen. Its totally vegan, but uses a lot of spices to make the dishes palatable. This dish is totally cozy food-- hot, thick, and rich. Best of all its really fast and easy to make. Heat oil in heavy-based pan. Saute onion until softened, stirring occasionally. Add garlic, carrot, cumin and mustard seeds, and ginger. Cook for 5 minutes stirring, until the seeds pop and the carrot softens slightly. Stir in the tumeric, chile powder and garam masala, and cook for 1 minute, stirring to make sure spices don't burn. Add lentils, water and tomatoes, and season well with ground pepper. Bring to a boil, then reduce the heat and simmer, covered, for about 45 minutes, stirring occasionally. Stir in the lime juice and 3 Tbsp cilantro. Cook for about 15 more minutes to make sure the lentils are tender. Serve and garnish with the remaining cilantro and the toasted almonds. Excellent with a dollop of plain yogurt on top, when you aren't detoxing of course. I haven't made lentils yet this fall, and you're right -- it is time!! This looks really delicious. Someday I'd like to have a fig farm-- dozens of trees, but for now I only have two. This is a blog where I focus on gardening, cooking, home renovation and occasionally personal style. My main home is in Albuquerque, but for the last year (nearly!) I've been living in Southern California for work. Things I want today but can not afford. All text and photographs © 2008 - 2013 Four Dog Fig Farm, unless otherwise noted.